Bennett Foddy's Speed Chess is not actually chess. It looks like chess and the pieces make chess moves, but it is the exact opposite of chess. And now you can play it, totally for free with up to 15 other people! Bennett Foddy (creator of QWOP and Super Pole Riders) originally made this game for NYU's No Quarter exhibition last year. 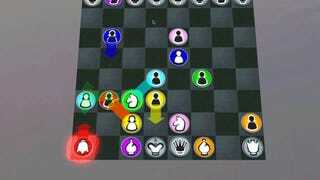 Up to 16 players take the role of various chess pieces, moving at the exact same time with no turns. Games are lightning fast, confusing, and motivated almost purely by impulse. Bennett Foddy's Speed Chess is free to download here (I hope you have a bunch of controllers). You can follow Bennett on twitter here.